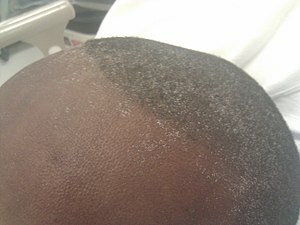 Uremic frost present on the forehead and scalp of a young man who presented with complaints of anorexia and fatigue, with blood urea nitrogen and serum creatinine levels of approximately 100 and 50 mg/dL respectively. Azotemia is another word that refers to high levels of urea and is used primarily when the abnormality can be measured chemically but is not yet so severe as to produce symptoms. Uremia describes the pathological and symptomatic manifestations of severe azotemia. There is no specific time for the onset of uremia for people with progressive loss of kidney function. People with kidney function below 50% (i.e. a glomerular filtration rate [GFR] between 50 and 60 mL) and over 30 years of age may have uremia to a degree. This means an estimated 8 million people in the United States with a GFR of less than 60 mL have uremic symptoms. The symptoms, such as fatigue, can be very vague, making the diagnosis of impaired renal function difficult. Treatment is to perform dialysis or a renal transplant. Classical signs of uremia are: progressive weakness and easy fatigue, loss of appetite due to nausea and vomiting, muscle atrophy, tremors, abnormal mental function, frequent shallow respiration and metabolic acidosis. Without intervention via dialysis or kidney transplant, uremia due to renal failure will progress and cause stupor, coma and death. Because uremia is mostly a consequence of kidney failure, its signs and symptoms often occur concomitantly with other signs and symptoms of kidney failure. Glomerular filtration rate (GFR) measures the amount of plasma being filtered through the kidneys. As the GFR decreases, the prognosis worsens. Some of the effects can be reversed with dialysis. People on dialysis acquire what is known as "residual syndrome". Residual syndrome is a non-life-threatening disease which is displayed as toxic effects causing many of the same signs and symptoms that uremia displays. There are several hypotheses why residual syndrome is present. They are: the accumulation of large molecular weight solutes that are poorly dialyzed (e.g. β2-Microglobulin); the accumulation of protein-bound small molecular weight solutes that are poorly dialyzed (e.g. p-cresyl sulfate and indoxyl sulfate); the accumulation of dialyzable solutes that are incompletely removed (e.g. sequestered solutes like phosphate in cells or insufficient elimination of other more toxic solutes); indirect phenomena such as carbamylation of proteins, tissue calcification, or a toxic effect of hormone imbalance (e.g. parathyroid hormone) and; the toxic effects of dialysis itself (e.g. removal of unknown important vitamins or minerals). Dialysis increases life span but patients may have more limited function. They gain physical limitations which include impairment of balance, walking speed and sensory functions. They also retain cognitive impairments such as impairment in attention, memory and performance of higher-order tasks. Patients have been maintained longer than three decades on dialysis, but average mortality rates and hospitalizations are high. Also, patient rehabilitation and quality of life is poor. Conditions causing increased blood urea fall into three different categories: prerenal, renal, and postrenal. Prerenal azotemia can be caused by decreased blood flow through the kidneys (e.g. low blood pressure, congestive heart failure, shock, bleeding, dehydration) or by increased production of urea in the liver via a high protein diet or increased protein catabolism (e.g. stress, fever, major illness, corticosteroid therapy or gastrointestinal bleeding). Renal causes can be attributed to decreased kidney function. These include acute and chronic kidney failure, acute and chronic glomerular nephritis, tubular necrosis and other kidney diseases. Post renal causes can be due to decreased elimination of urea. These could be due to urinary outflow obstruction such as by calculi, tumours of the bladder or prostate, or a severe infection. A detailed and accurate history and physical will help determine if uremia is acute or chronic. In the cases of acute uremia, causes may be identified and eliminated, leading to a higher chance for recovery of normal renal function, if treated correctly. Primary tests performed for the diagnosis of uremia are basic metabolic panel with serum calcium and phosphorus to evaluate the GFR, blood urea nitrogen and creatinine as well as serum potassium, phosphate, calcium and sodium levels. Principal abnormality is very low (<30) GFR. Uremia will demonstrate elevation of both urea and creatinine, likely elevated potassium, high phosphate and normal or slightly high sodium, as well as likely depressed calcium levels. As a basic work up a physician will also evaluate for anemia and thyroid and parathyroid functions. Chronic anemia may be an ominous sign of established renal failure. The thyroid and parathyroid panels will help work up any symptoms of fatigue, as well as determine calcium abnormalities as they relate to uremia vs longstanding or unrelated illness of calcium metabolism. A 24-hour urine collection for determination of creatinine clearance may be an alternative, although not a very accurate test due to the collection procedure. Another laboratory test that should be considered is urinalysis with microscopic examination for the presence of protein, casts, blood and pH. The most trusted test for determining GFR is iothalamate clearance. However, it may be cost-prohibitive and time-consuming. Clinical laboratories generally calculate the GFR with the modification of diet in renal disease (MDRD) formula or the Cockcroft-Gault formula. In addition, coagulation studies may indicate prolonged bleeding time with otherwise normal values. Uremia results in many different compounds being retained by the body. With the failure of the kidneys, these compounds can build up to dangerous levels. There are more than 90 different compounds that have been identified. Some of these compounds can be toxic to the body. Uremic toxins are any biologically active compounds that are retained due to kidney impairment. Many uremic salts can also be uremic toxins. Urea was one of the first metabolites identified. Its removal is directly related to patient survival but its effect on the body is not yet clear. Still, it is not certain that the symptoms currently associated with uremia are actually caused by excess urea, as one study showed that uremic symptoms were relieved by initiation of dialysis, even when urea was added to the dialysate to maintain the blood urea nitrogen level at approximately 90 mg per deciliter (that is, approximately 32 mmol per liter). Urea could be the precursor of more toxic molecules but it is more likely that damage done to the body is from a combination of different compounds which may act as enzyme inhibitors or derange membrane transport. Many regulatory functions of the body are affected. Regulation of body fluids, salt retention, acid and nitrogenous metabolite excretion are all impaired and can fluctuate widely. Body fluid regulation is impaired due to a failure to excrete fluids, or due to fluid loss from vomiting or diarrhea. Regulation of salt is impaired when salt intake is low or the vascular volume is inadequate. Acid excretion and nitrogenous metabolite excretion are impaired with the loss of kidney function. Urea was crystallized and identified between 1797 and 1808. Urea was hypothesized to be the source of urinary ammonia during this time and was confirmed in 1817. It was hypothesized that excess urea may lead to specific disorders. Later in 1821, it was confirmed that the body did produce urea and that it was excreted by the kidneys. In 1827, urea was first synthesized in the lab, confirming the composition of urea and making it the first biological substance synthesized. In 1856, urea was produced in vitro via oxidation of proteins. It was in 1850 that Thomas Dutrochet seeded the idea of dialysis with the discovery of separating smaller molecules from larger molecules through a semipermeable membrane. It was in 1829 and 1831 when convincing proof was obtained that in certain patients, blood urea was elevated. They also suggested that harm may be caused by this. Later research suggested that major neurological disorders like coma and convulsions did not correlate with physical findings which included generalized edema of the brain. This suggested that uremia was a form of blood poisoning. In 1851, E.T. Frerich described clinical uremic syndrome and suggested that a toxicity was the mechanism of its cause. It was in 1856 that J. Picard developed a sensitive method to reproducibly measure blood urea. He was able to detect a 40% decrease of urea concentration between the renal artery and the renal vein. This work solidified the fact that renal failure coincided with an increase in blood urea. It was J. Picard with E.T. Frerich's work that made the term uremia popular. ^ There may be multiple sources. Only one is listed. ^ a b The "middle molecules" include: atrial natriuretic peptide, cystatin C, delta sleep-inducing peptide, interleukin-6, tumor necrosis factor alpha, and parathyroid hormone. ^ a b c d e f Bishop, M.L. ; Fody, E.P. ; Schoeff, L.E. Clinical Chemistry: Techniques, Principles, Correlations (6th ed.). Lippincott Williams and Wilkins. p. 268. ^ a b c d e f g h i j k l Burtis, C.A. ; Ashwood, E.R. ; Bruns, D.E. Tietz. Textbook of Clinical Chemistry and Molecular Diagnostics (5th ed.). Elsevier Saunders. p. 1554. ^ a b c d e f g h i Meyer TW; Hostetter, TH (2007). "Uremia". N Engl J Med. 357 (13): 1316–25. doi:10.1056/NEJMra071313. PMID 17898101. ^ a b Almeras, C.; Argiles, A. (2009). "The General Picture of Uremia". Semin. Dial. 22 (44): 321–322. doi:10.1111/j.1525-139X.2009.00575.x. PMID 19708976. ^ a b c d e Depner, T.A. (2001). "Uremic Toxicity: Urea and Beyond". Semin. Dial. 14 (4): 246–251. doi:10.1046/j.1525-139X.2001.00072.x. ^ Dobre, M.; Meyer, T.W. ; Hostetter, T.H. (2012). "Searching for Uremic Toxins". Clin J Am Soc Nephrol. 8 (2): 1–6. doi:10.2215/CJN.04260412. PMC 3562857. PMID 23024165. ^ a b Zhang LS, Davies SS (April 2016). "Microbial metabolism of dietary components to bioactive metabolites: opportunities for new therapeutic interventions". Genome Med. 8 (1): 46. doi:10.1186/s13073-016-0296-x. PMC 4840492. PMID 27102537. ^ a b c d e Richet, Gabriel (1988). "Early history of Uremia". Kidney International. 33 (5): 1013–1015. doi:10.1038/ki.1988.102.